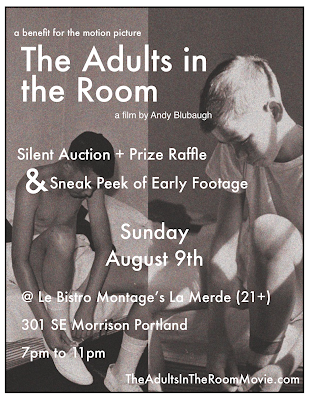 Join me & director Andy Blubaugh (Sundance selections Hello Thanks, Scaredycat) as well as the cast and crew of his debut feature The Adults In The Room, for an intimate evening of food, drink, and debate benefiting the production. Get a first look at rough cuts from the documentary portion of the film, bid on one-of-a-kind art items in our silent auction, and engage in a lively debate about this genre-defying and controversial film. Admission is free, but a suggested donation of $20.00 will be rewarded with a limited edition signed and numbered DVD of Andy Blubaugh's award-winning shorts. I'll be featuring the work of artists that are contributing here- stay posted!